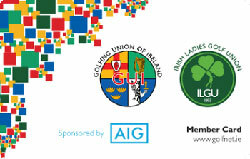 Your GUI / ILGU member card contains your unique member number and you need this for a variety of functions, one of which is for logging onto www.golfnet.ie and checking your handicap. How do I access my handicap? I can’t find my member card – what should I do? Please notify the club that it is lost so they can order you a new one. When you get it you can complete registration. I get an error message when I click on ‘Send Verification Email’ – what’s wrong? In most cases your member number and PIN do not match or the PIN has expired. You need to use the PIN from the most recent membership card issued. The correct card is a joint GUI & ILGU card with AIG branding on it. If your card does not have the AIG branding then you need to get the club to order a new card for you. You may also get an error saying your member number has not been found. In this case please contact your club as you may have been deactivated in error. Will the password I had on the old Golfnet site work? Your old password will not allow you to login. We upgraded the security of passwords so we require all users to choose new, more secure passwords. I haven’t got an email from Golfnet – what’s wrong? You should check your Spam / Junk mail folders to see if the email has been filtered there. There have been instances where emails sent to certain domains like Hotmail have not arrived. Golfnet has no control over this and in these instances we can see the emails leaving our servers. If this happens, we suggest you try an alternative email address. I used my email address to setup another account (wife, sister, brother, husband, daughter) and now I can’t register my own account – what do I do? Golfnet now requires each user to have an email address registered that is unique to that account. It ensures we can reset passwords to the correct user and improves overall security. You will need to use an alternative email address. I can’t click on the link you sent me – what’s wrong? Some email providers prevent you from clicking directly on links in emails. In these cases you need to copy and paste the link into your browser. The link we send you expires after 24 hours. If the email is older than this please start the registration process again. Clicking on an old link will not allow you to complete registration and you will get an error message.